The Deer Hunter – Did You See That One? The Vietnam War is raging, and the working-class town of Clairton, Pennsylvania is not immune to the cost. The cost of war isn’t limited to the battlefield, and the returning soldiers continue to live disrupted lives because of their service. This movie won five Academy Awards, including Best Picture. The film was directed by Michael Cimino (Heaven’s Gate) and used a screenplay that is credited to himself, Deric Washburn (Extreme Prejudice), Louis Garfinkle (The Doberman Gang), and Quinn K. Redeker (Ordinary People). The contributions of Cimino and Washburn would later be questioned in a dispute between the pair. Despite the controversy, the writing team was nominated for Best Original Screenplay. Michael Cimino also won Best Director for this one. The film’s cast includes Oscar winners Robert DeNiro (The Mission), Christopher Walken (Wedding Crashers), and Meryl Streep (Manhattan). The movie also stars John Cazale (The Godfather), and John Savage (The Thin Red Line). The controversy aside, the writing for this film is very good. The story is built in three acts, each with a unique purpose in the overall story. The first act does a great job setting up the character relationships as well as the somewhat isolated world that they live in. The dialogue helps to bring the factory town of Clairton, Pennsylvania to life. There’s something refreshing about the honesty of the dialogue as it reveals the wants and needs of the characters. Each of them has such deep flaws as well as wonderful attributes. All of this makes the characters easy to relate to. As the story progresses, it transitions smoothly from the small town in Pennsylvania to the jungles of Vietnam. The war scenes in this film are among the more controversial of the film. While the action is intense, and the drama nicely done, the premise is questionable. What is best called the “Russian roulette” scene is a powerful moment that many argue has no place in a film about Vietnam. Taking out the controversy, this is one of the best written moments of the movie. While this might be seen as an anti-war film, I would argue that it seeks more to highlight the cost of war than to protest war itself. This story definitely earned the Oscar nomination it got. The acting in this movie features great performances from a number of the great talents of Hollywood. Robert DeNiro leads the way with a performance that seems to be built around a quiet intensity that rarely surfaces. His performance as a soldier feels authentic, and he pulls off the grittier moments perfectly. DeNiro would earn his third Oscar nomination (his second for Best Actor in a Leading Role) for this film. Christopher Walken won a Best Supporting Actor Oscar for his work on this film. His performance is so genuine and emotional that it elevates the second and third acts of the film. Like DeNiro, he seemed to understand how to adjust his role throughout the film. John Savage adds his own good performance to this film. Like Walken, he really nailed the emotional strain on his character. Along with DeNiro and Walken, Savage helped to bring the bond between these soldiers to life. John Cazale is great in this movie, his last role. He does such a good job playing an antagonistic and intense young man. Like his work in The Godfather, he seems to find just the right energy for the moment. Throughout his career, which was sadly cut short by cancer, he seemed to make something special happen with every role. Meryl Streep also does great work in this movie. This was only her second feature film role, and she took it mainly to stay close to Cazale. The two were in a relationship, and she wanted to spend as much time with him as she could. Much of the filming schedule was adjusted just to be sure that Cazale could complete his role. Despite the stress of this situation, Streep took an inconsequential character and brought her to a level of importance that the story couldn’t do without. Her work earned Streep her first Academy Award nomination for Best Supporting Actress. The cast has such great chemistry throughout this movie and it pays off in every scene. The visuals are another highlight of this movie. Vilmos Zsigmond earned an Oscar nomination for Best Cinematography for his work on the movie. In addition, the film Peter Zinner an Oscar for Best Film Editing. The film also won Best Sound, bringing the total to nine nominations and five wins. 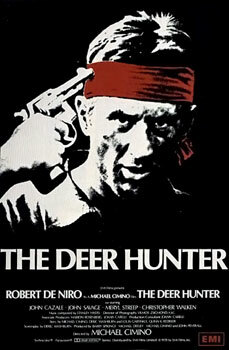 Since then The Deer Hunter has become a highly debated film. In the more than 35 years since it was released the critics have gone back and forth over the successes and failures of the film. While initial reactions were positive, this film has been revisited by critics with varying degrees of love and disdain. I don’t put too much stock behind the controversies that have surrounded this film. While the story has some issues, the film works more than it doesn’t. I think it’s one of the great examples of a film focusing on the hidden costs of war. If you’re a fan of war movies this is one you need to see. I would also suggest this to any fans of the stars in this one. I give this one 4 out of 5 stars. this was such a great and powerful movie! great review! It’s interesting because I can see all of the logic in the reasons people dislike it, but I still love this one. Pingback: Catch Me If You Can | Did You See That One? Pingback: Blow Out | Did You See That One? Pingback: The Jungle Book (2016) | Did You See That One? Pingback: The Rose – Did You See That One?